Washington, Missouri (January 2013) – Hillermann Nursery & Florist joined the ranks of the horticulture industry’s top independent garden centers when it was named one of Today’s Garden Center’s Revolutionary 100. This is the eighth year that the company has received this award. The program, now in its eighth year, surveys garden center owners and managers and culminates in a listing of the 100 most revolutionary garden centers in the nation. It is open to all independent garden centers, large and small, and is based on leadership and innovation, not on size or revenue. “It is a great honor to be named to the Revolutionary 100 list of 2013, especially since it is the eighth year for us to receive this prestigious award. Our company has been in business since 1951, and we are striving to find new ways to serve our customers and community better each year. We have many changes in the nursery and garden center and exciting new offerings coming in 2013. Our willingness to try new items and make creative displays helps us stay revolutionary,” says Sandi Hillermann McDonald, president of Hillermann Nursery & Florist. Garden center owners and managers across the United States fill out an extensive online questionnaire covering topics such as customer and community service, management philosophy, marketing, use of technology, purchasing and profitability. The entrants are ranked according to a point system, and the 100 top entries make the list. 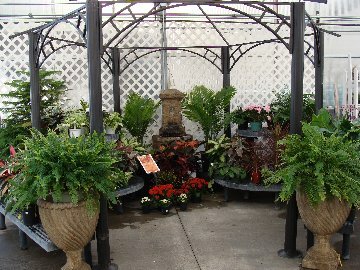 Established in 1951, Hillermann Nursery & Florist is operated by second-generation family members. It is a large, diversified company, employing more than 80 people and providing a wide variety of services within its departments of Garden Center, Nursery/Greenhouse, Florist/Gift Shop, Landscape Division, and Equipment Center. Beautiful items are available to accent your home indoors and outdoors including new styles and trends. Perennial plants, annual plants, vegetable plants, container gardens, and hanging baskets, as well as a large selection of nursery trees and plants are available throughout the growing season. Quality lines of lawn and garden equipment, plus dependable service and repairs, are available in the Equipment Center. Hillermann’s Landscape Division offers residential and commercial landscape, irrigation and landscape lighting design, installation, and maintenance. Commercial snow removal, lawn maintenance, lawn grading and seeding, and aquatic weed control services are also available. The 2013 Revolutionary 100 Awards program is sponsored by one of the industry’s premier plant suppliers, Suntory Flowers.